Provides a forum for students, faculty, and staff who are interested in the teaching profession and provides support, information, and community outreach. The American Sign Language (ASL) Club is for anyone who is interested in learning more about ASL. Through various club activities, students are encouraged to use ASL as much as possible outside of the classroom and with native Deaf users. Activities differ each quarter, depending on student needs and interest. ATSO Vision Statement: The goal of the Athletic Training Student Organization is to provide the opportunity for excellence to the Athletic Training Students of Wright State University so that they may become the leaders of the future in the Athletic Training setting. This organization will aim to: create an optimal learning environment, create a social network within the Health Care community, take a proactive stance in educational endeavors, as well as create a better working atmosphere for the Athletic Training Student. Chi Sigma Iota (CSI) is the international honor society for students, professional counselors and supervisors, and counselor educators. The CSI mission is to promote scholarship, research, professionalism, leadership and excellence in counseling, and to recognize high attainment in the pursuit of academic and clinical excellence in the profession of counseling. The Collegiate Middle Childhood Association provides a forum for undergraduate and graduate students who are interested in the middle school student and the professional issues and activities of the middle childhood teacher. Kappa Delta Pi is an international honor society in education. Individuals are invited to become members of the society, by vote of the chapter, because of high academic achievement and because they have exhibited a professional attitude indicating their ability to grow in the field of education. The club is for any Sports Science major. The Professional Development Club inspires students in higher education to develop marketable leadership skills. Through community involvement, special projects, and collaboration with peers, faculty, and local organizations, participants will recognize and enhance their personal leadership potential. The Rehabilitation Services Organization provides rehabilitation majors and minors with opportunities to develop contacts with rehabilitation professionals, participate in professional conferences and service projects, and interact with peers on a social level. The Student Affairs Graduate Association is an organization for and by students interested in pursuing a career in Higher Education and/or Student Affairs. The organization plans social events, provides professional development opportunities, and acts as a liaison between the program and the cohorts. Aizhan Kydykeeva is the Student Government Senator for the College of Education and Human Services for the 2017-18 school year. You can contact her with any questions, comments or concerns you may have about the college by email at kydykeeva.2@wright.edu, or by stopping by the Student Government office located in 029H Student Union. Visit the Student Government website to learn more. 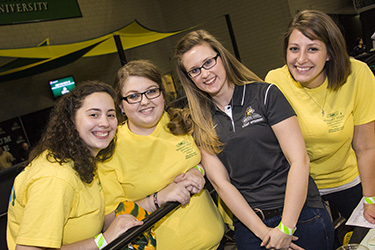 The Wright State chapter of NAEYC provides support, encouragement and professional knowledge to Wright State students who are interested in becoming early childhood educators. NAEYC is dedicated to improving the well-being of all young children, with particular focus on the quality of educational and developmental services for all children from birth through age 8.